R.L Budget Accommodations i Langkawi, Malaysia: Bestill nå! RL Budget Accommodations or Rainbow Langkawi, is a Back Packers paradise. It is situated in a prime area where, the main Beach with the best view of sunset is just about 4 mins walk away. On site Restaurant Café is available for breakfast Lunch and Dinner. Friendly Staff and most of all English spoken staff. We are popular among the Taxi and Van Transport Operators. Just mention Rainbow Pantai Cenang. We are located not more than 15 mins away from The Airport, 45 mins away from the Ferry Terminal. All daily facilities is just a thought away. 7 Eleven, Money Changer, 24 hrs Mart, Day and Night food Stalls and Beach Bars to Relax and Unwind yourself. We have Standard Double Fan Rooms with Private Bathroom. 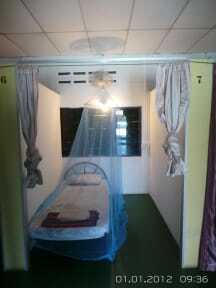 Standard Double Air Conditioned Room with Private Bathroom (hot shower) and Balcony. Towels, Blanket and Toilet Rolls are provided. On Site we also provide Bicycle, Scooter and Car Rental. Purchasing of Transport Tickets and Tours (Malaysia Thailand Tours) is available from our Off on Site. Try us and experience in meeting people from all over the world! Rainbow Langkawi Your Get Away Hide Out. *Scooter or Motor bike Hire services is available.